Greenhouse Gas Emissions in the U.S. The Energy Information Administration (EIA) of the U.S. Department of Energy (DOE) publishes an annual report on the Greenhouse Gas Emissions in the US economy. The executive summary of the 2005 report shows a Sankey diagram on page xv. This Sankey diagram shows on the left side the different sources of CO2 (mainly combustibles), and on the right hand side the industrial sectors (residential, commercial, industrial and transport) that contribute to the CO2 release. Emissions are in million ton CO2-equivalents. The original Sankey diagram from the report has been reproduced with the e!Sankey software, and is shown below. Footnotes have been omitted, for full detail please refer to the original source. Comments Off on Greenhouse Gas Emissions in the U.S. 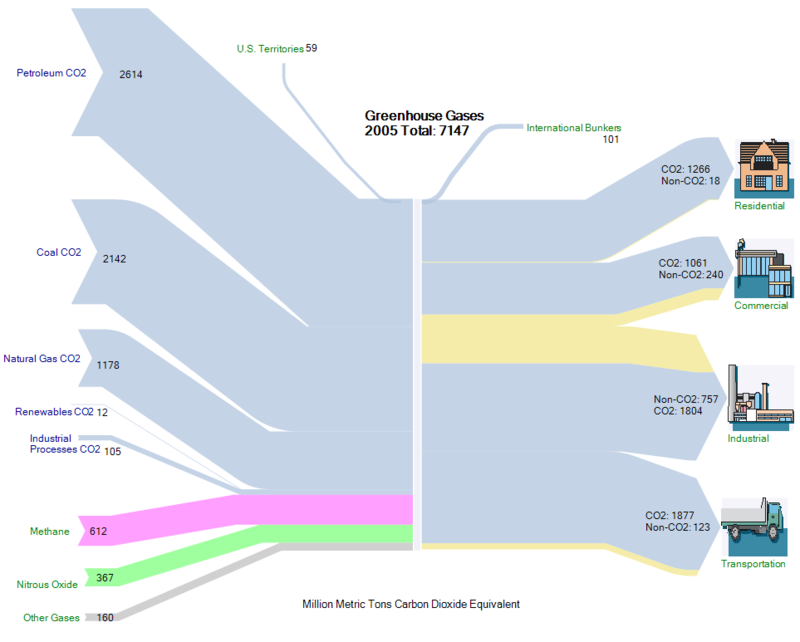 Tags: CO2, environment, GHG, greenhouse gases, U.S.